"found birds; 2000 - the present"
Until recently, I was unfamiliar with Susan Silas' artwork. She is perhaps best known for projects memorializing the Shoah, but it wasn't an awareness of her Holocaust work that led me to "Helmbrecht's Walk, 1998-2003." 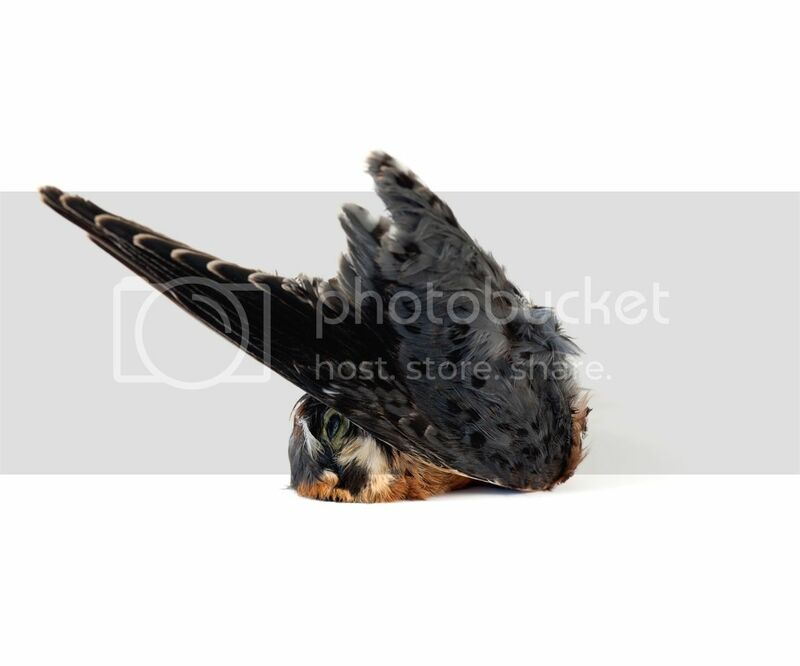 Instead, it was a photograph of a dead American kestrel that Silas emailed me in March. I have only an inkling of what essay or artwork of mine inspired the artist to send me the image, but I'm grateful that she did. I shamelessly admit to being the sort who finds soulful beauty in images of death, and I was touched by the striking and contemplative photograph. A month after I received the picture, I visited Silas in her Brooklyn home, to look at prints from her "found birds" series. Still pondering her work a week after that visit, I headed to Hebrew Union College's Jewish Institute of Religion Museum, eager to compare what I saw and sensed in "found birds" to Susan's more easily classifiable (though by no means "easy") Shoah work. The HUC press release for "Helmbrecht's Walk" describes the project succinctly. "On April 13, 1945, more than 700 women were forced to march 225 miles in 22 days from the Helmbrecht's Labor Camp, a small satellite unit of the Flossenburg Concentration Camp in Germany, to the Czech city of Volary. [...] During the course of this forced march the women were ill fed, inadequately clothed, denied shelter, and capriciously beaten. On the sixth day of the march, the non-Jewish prisoners were separated from the group, leaving the remaining 580 Jewish women to continue until May of 1945. With determination and sensitivity, Silas traced the march in 1998 on the 53rd anniversary of the event by walking along the same path as the Helmbrecht's women for 22 days in Germany and the Czech Republic. 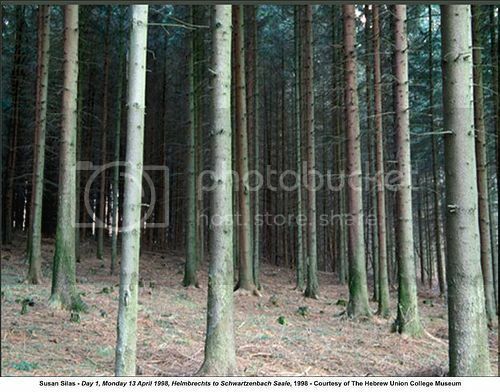 She documented her journey in Helmbrecht's Walk, a collection of 48 archival color prints presented as an unbound book. [...] The images contextualized by Silas' daily commentary of her own experiences are coupled with news reports of event occurring elsewhere in the world on that same day in 1998. This juxtaposition, she says, functions 'to heighten our awareness of the fact that we are all presently witnesses to unspeakable events and extreme suffering for which we take no more responsibility than did many witnesses to the Holocaust.'" Silas' project addresses the complicated relationship between place and time or, as cultural critic and historian Simon Schama's consideration of the topic framed it, "landscape and memory." When Silas conceived of the Helmbrecht's project, she believed (or maybe hoped) that walking the same path that the Helmbrecht's women had would allow her some intimate experience of or insight into the terrible march. In fact, this didn't prove so. Silas describes her walk as "relatively mundane and unexceptional." She continues, "My feet hurt. I get tired. [...] I found it more, rather than less difficult to understand how these women made this journey once I was out on the road." "Helmbrecht's Walk, 1998 - 2003"
Yet many of the captions she includes with the photographs reference artists and thinkers such as Werner Herzog, who understand "walking as a sacrament." Such language calls to mind the Australian Aborigines' songlines, mnemonic stories that are spoken or sung as the Aborigine walks over the referenced terrain. In his marvelous book Spell of the Sensuous, David Abram relates a striking, relevant anecdote. '[w]e came to the confluence of two streams: that is, we met the stream we had crossed higher up on the main road. This lesser stream was the route of Tjilpa Men, and we were joining it at right angles. As Arkady turned the wheel to the left, Limpy bounced into action. Again he shoved his head through both windows. His eyes rolled wildly over the rocks, the cliffs, the palms, the water. His lips moved at the speed of a ventriloquist's and, though them, came a rustle: the sound of wind through branches. Arkady knew at once what was happening. Limpy had learnt his Native Cat couplets for walking pace, at four miles an hour, and we were traveling at twenty-five. Arkady shifted into bottom gear, and we crawled along no faster than a walker. Instantly, Limpy matched his tempo to the new speed. He was smiling. His head swayed to and fro. The sound became a lovely melodious swishing; and you knew that, as far as he was concerned, he was the Native Cat.'" I believe that what was missing for Silas was a story line, the narrative informed by the landscape (and vice versa) that, among indigenous groups such as the dwindling Aboriginal population of Australia, is traditionally passed from generation to generation. In some respects, "Helmbrecht's Walk" is an attempt to locate such a story, an earnest effort to discover in the landscape the marks of what happened decades before. In our postmodern, peripatetic culture, nations and traditions do not generally fare well. In some respects, this is a positive development, as our tribal perspectives and prejudices erode into some variety of tentative, liberal pluralism. On the other hand, it's ever more difficult to feel confident about one's identity and how it relates to landscape, vocation, and nation. My time with "Helmbrecht's Walk" confirmed my supposition, however, that Susan's art is not primarily interested in cultural identity or particular histories. Instead, she is most concerned with "the big questions." To one degree or another, all art wrestles with or reacts to these existential imponderables, but Susan's exploration is more focused and urgent than most. Fortunately, even though her work is preoccupied with mortality and meaning, she manages to avoid the pitfalls of such terrain; her work is neither macabre nor aestheticized to the point of anesthetization. "A crucial concept held by many existentialist philosophers is that of heroic living. All humans have the ultimate freedom to live boldly in the face of tragedy. Living with this concept makes attaining a goal of eudaimonia less important than simply striving to do so. [...] The concept of tragic optimism proposes that in a life that can be circumscribed by pain, guilt, and death, one should say 'yes to life in spite of everything.'" "Acknowledging our species' precarious position is not defeatist; on the contrary, accepting the inevitable nourishes the individual's desire to contribute. Faced with an impossibly difficult prospect, only individual effort can sustain us. As Albert Camus concluded in The Myth of Sisyphus, 'The struggle itself is enough to fill a man's heart. One must imagine Sisyphus happy.'" The Shoah is bleak history, a subject watered by the blood of millions, and it is fertile soil for such "big questions." Silas' "found birds" remind us that so, too, is the striving and passing of a blackbird. The artist's reckoning with death is her own form of "heroic living." Problem is, she is taking life and death out of nature, and into a sterilized realm of man alone. Where is nature, god, and even humanity? Nice in concept, the problem with all contempt art as the only concept worth evolving and dealing with is God. I will email you some shots of death in all its grizzliness, a human reaction, not truth, later this evening. Death is not to be analyzed in academic and sterile surroundings, this takes away its reality of life as one. I have seen much death, just lost an old friend last week, an ex bodyguard for Death Row records, appropriately enough, but the sweetest thug you ever met. He simply did what he was good at, but as the pastor said who was his spiritual father, he was everyone's Friend. RIP Big Joe. While I agree that Silas' "found birds" are shown out of their natural context, I feel this provides the viewer with an opportunity to more wholly investigate the subject. I suppose this is an argument for the merit of recontextualization. 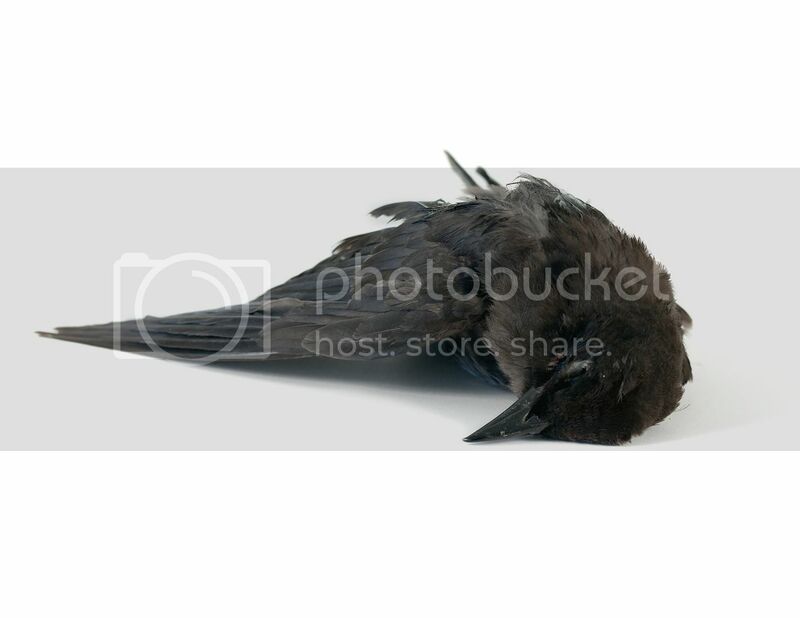 I'm not a proponent of mere recontextualization (i.e., something is dubbed "art" simply because it's placed in an arty context), but Silas only removes the surroundings; the dead bird is still a dead bird (nature is therefore still nature). Certainly, it would be a better world if everyone opened fully to experience as we see it every day, every object and view in it's rightful place...but sometimes a tweaking is necessary. Sometimes we need to notice one facet before we can see the whole diamond. There's nothing wrong with that.